I am very pleased to bring you this Fall 2017 issue of MinneTESOL Journal. This issue features four distinct, in-depth invited pieces situated in K-12 and adult English as a Second Language (ESL) contexts. In the K-12 arena, Dr. Martha Bigelow and Dr. Kendall King argue that ‘Minnesota nice’ has shaped the development and implementation of Minnesota’s Learning English for Academic Proficiency and Success (LEAPs) Act, impacting its effectiveness in supporting language minority students in Minnesota. In the area of adult ESL, Dr. Jen Vanek describes unplanned outcomes of a technology professional development (PD) initiative for Adult Basic Education (ABE) teachers, with important implications for anyone creating PD for teachers. Dr. Nancy Popp, a developmental psychologist with research experience in ABE/ESL programs, describes developmental growth in adulthood and the different related “mindsets” learners bring to the classroom. She then discusses how understanding this “different kind of diversity” can help adult ESL educators appreciate the developmentally distinct perspectives of their adult learners, supporting not only their learning, but growth. Finally, Dr. Andreas Schramm, a once English learner turned linguist and teacher educator, explains what makes English’s tense and aspect system tricky to teach and learn. Based on teacher research he’s advised and preliminary findings from his own recent sabbatical, he also shows how it can nonetheless be successfully taught in adult ESL and English as a Foreign Language (EFL) contexts. As new Editor of MinneTESOL Journal, I am excited to share these rich articles with you and am very grateful to outgoing Senior Editors, Dr. Kim Johnson and Dr. Anne Dahlman, for their support in the leadership transition of this rigorous yet relevant, fully online and open access publication. Thanks to Dr. Jen Vanek for her invaluable service to the journal, as technical editor, and for all the other ways she also supports the publication process. MinneTESOL Journal relies on the generous expertise of its board and external reviewers. A hearty thanks to all who participated in this fall issue. Please read, comment on, share, and enjoy the articles in the Fall 2017 MinneTESOL Journal. In this action research report, the author describes key turns in a professional development opportunity on using social media in classrooms, which was created and implemented for teachers of English language learners. The paper features reflection about the researcher/PD facilitator role and its impact on the engagement of the participating teachers. Teachers are generally their own best critics and will usually willingly invest time and attention beyond what is compensated to improve the learning experiences of their students. Because our days are filled with encounters with digital technologies, this work includes figuring out how to make good use of information and communication technologies (ICTs) in the classroom. This shift has pushed teachers to rethink long-held instructional preferences and routines and has created tension in the work day of some who are figuring out how to embrace ICTs. Practitioner-oriented education conferences usually offer professional development (PD) options to help teachers cope with new technologies. Other options abound, as well, including webinars and personal learning communities. What follows is a description of a PD project that I created a few years ago, when I was asked by leaders of a group of programs supporting adult English language learners (ELLs) to develop training on integrating social media into English language and literacy classrooms. The impetus for the PD was the program leaders’ observation that, despite access to training workshops and conference presentations, many area teachers were not using technology in their classrooms. The goal of the PD was, therefore, to encourage the participating teachers to build their ICT skills by using them in a supportive online community of practice, so that they could eventually integrate use of social media into their instruction. As both PD facilitator and researcher in this project, my involvement provided an opportunity to observe the dedication and fears of these teachers as they experimented with new ideas and worked to overcome barriers that shaped their participation. This positionality situated me for a reflexive approach to the PD, and throughout the project I adjusted the shape of the PD in response to their needs. Hence, the development and implementation of the PD became a cyclical process that mirrored the reflexive and collaborative nature of action research (Adelman, 1993; Avison, Baskerville, & Myers, 1998; Carr, 2006; Williams, 2007). I implemented the PD and continually reflected on and revised it based on feedback that I got from the teachers along the way. This reflexive cycle, the process that serves as the backbone of action research, elucidated several useful findings. Firstly, teachers need more opportunities to try out new technology in thoughtful ways, but this is hard work. Secondly, real shifts in instructional practice and use of ICTs cannot happen without adequate infrastructure and affective support for the teachers engaged in the work. Finally, the PD itself must meet teachers where they are, not push beyond their current skill or comfort level, especially when it involves technology use. Both the literature and my personal experience show that much PD on technology issues is provided in singular workshops or presentations (Jacobson, 2012; 2016). Indeed, this is the preferred approach of many ABE teachers (Marchwick, Johnson, & Parrish, 2008); however, in this new world of continuous technological development, it is likely insufficient for effecting lasting change in practice. Previously published literature shows that the approach falls short because of limited technology skills of teachers, insufficient opportunities for experimentation, and lack of infrastructure to support implementation (Jacobson, 2012; Vrasidas & Glass, 2007). Further, teachers need sustained practice over several years in order to gain comfort integrating ICT into classrooms (Donnelly et al., 2002). Communities of Practice (CoP), a group of people who come together to accomplish a shared goal by working together to produce shared resources, provide the means by which to engage in such extended PD (Wenger, 2000). CoPs are “devised for the purposes of knowledge construction among professionals; they are social structures providing an opportunity to build skills and relationships, providing the means through which professionals can engage…” (Brooks, 2009, p. 26). Online venues for CoP marked by rich dialog and collaboration is the means by which learning occurs (Brooks, 2010). For this reason, establishing a CoP is a valid response to Vrasidas & Glass’ (2007) call for ongoing PD to meet educators’ need for lifelong learning opportunities, in this case in technology. In response to these findings I decided that an approach more thorough than a one-day workshop was required to encourage teachers to gradually build their own technology skills while, at the same time, gradually introducing a wider variety of learning technology into their classrooms. The purpose of the research was to, narrowly, explore the impact of such an extended professional development for adult EL teachers. More broadly, the study explored teacher preference in the range of PD activities offered. These two questions guided the study: 1) What issues inhibited and/or supported the participation of teachers in PD with an online component? 2) What changes in PD were required in response to the participation and needs and preferences of the participants? Action research is conducted with a pragmatic epistemological perspective where the production of knowledge begins with a practical problem to be solved, and where that new knowledge is not an end itself, rather a means for solving the problem (Oquist, 1978). It begins with an idea or value to test and, following an iterative dialogic process between facilitator and participants, the value and assumptions are revised (Checkland & Holwell, 1998). In this research, I began with a clear value – to support teachers as they used technology to learn how to integrate technology in their classrooms. What followed was a dialogic process where, as facilitator of the PD, I engaged with the participants to test this value or practice, engaged in a dialogic process and reflection which prompted revised assumptions and the course of the PD, and developed a better understanding of the issues involved with technology integration. The participants in this study were twenty-two midwestern adult education teachers. Most of the data comes from an important subgroup of participants, a group of ten teachers who all worked at the same community based organization that supported refugee integration and offered classes to English language learners from mostly southeast Asia. I will refer to it as the “Center” in this paper. The technology skill range of the teachers involved was wide. On one hand, there were several teachers from the Center who could not log in to their email accounts (they could not remember their passwords and did not know how to retrieve them); on the other hand, there were teachers from other organizations who were comfortable using basic word processing software, email, and integration of online resources in their classroom instruction. There were even a few who were building their own class websites. Based on my observation as a PD facilitator with ABE teachers, the tech skills of the teachers presented likely mirrored the range of skills evident in many ABE programs. The two-month PD project offered a range of opportunities to gather data that, as a whole, painted a picture of participant participation and perceptions of the PD itself. Observational notes. There were several occasions, both in-person meetings and webinars, after which I made notes about the experience of the participants as learners and mine as a facilitator. The content of these notes included my observations of teachers’ affect and comments they had made about barriers they experienced with technology. I also took copious notes while planning and making adjustments to the PD. Comments posted to blogs and online discussion forum. Teachers were encouraged to write blog posts discussing their integration of featured learning technology into their classrooms. Additionally, they had the opportunity to contribute to online discussions on the themes of the PD. The discussion pages were also a place for everyone, including me, to post resources. Interviews with two focal participants. Two of the participants who persisted in the PD agreed to be interviewed. These two female teachers from the Center were over the age of 55, had some competence in using common ICTs (but not more advanced skills like building websites), and were relatively new to teaching in ABE. My interviews were semi-structured and open-ended, which ensured that the same topics were covered with each interviewee but allowed for the flexibility of a conversational approach that encouraged relevant information and topics to emerge though follow-up questions (Cohen, D., 2006; Rubin & Rubin, 2012). As I engaged participants in a variety PD activities, I generated rich data from the sources described above. I confirmed the validity of these data using member checking (Lincoln & Guba, 1985) by ‘on the spot’ restating of participant ideas voiced during interviews and in conversations reported in observational data and by providing opportunities for participant review of interview summaries. To analyze these data, I relied on constant-comparison (Lincoln & Guba, 1985), reading notes and searching for shared themes and findings in multiple data sources. I developed these learning opportunities based on findings from prior research on professional development for educators (Jacobson, 2016; Vrasidas & Glass, 2007) and on use of technology in instruction (McCain, 2009; Mishra & Koehler, 2006; Moore, 2007; Rosen & Stewart, 2015). A description of the major components of the PD, as initially conceived, follows. 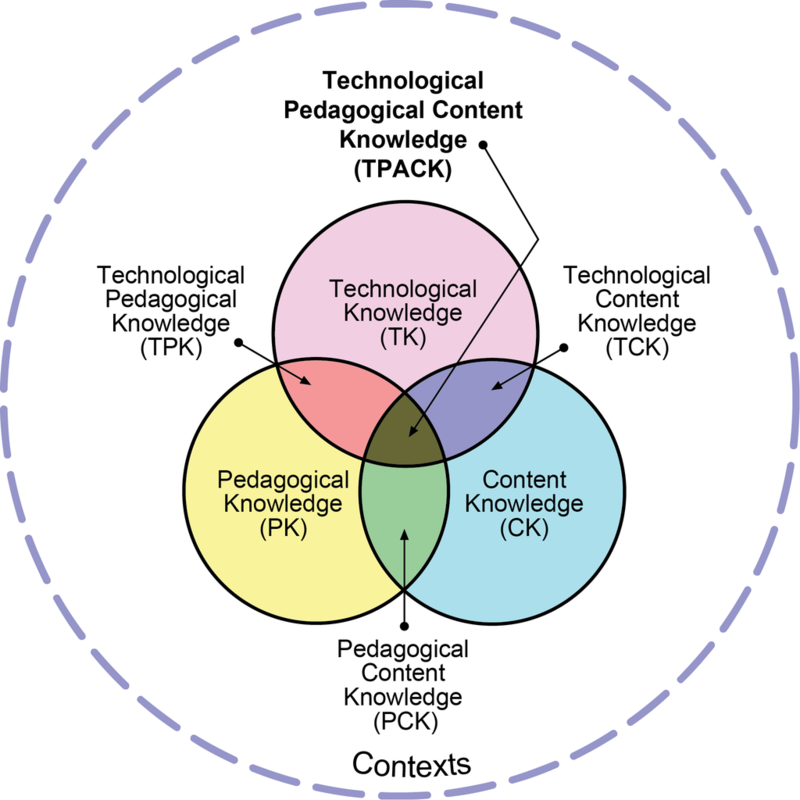 To support knowledge and skills growth with technology integration, I introduced the Technological, Pedagogical and Content Knowledge (TPACK) framework (illustrated in Figure 1), which was designed to model a teacher’s awareness of their personal knowledge of how each of the three components impacts their teaching (Mishra & Koehler, 2006). Mishra and Koehler (2006) suggest that a teacher can make best use of a learning technology if he/she/they has an awareness of personal knowledge in the three areas. This can serve as an impetus for a teacher to develop skills where lacking and to make thoughtful choices about how to match a particular technology in support of given content and instructional strategies (or, pedagogy, the “P” in the model). Further, such careful choices about employing ICT use in classrooms can illustrate the relevance of whatever technologies they employ. An important strategy for delivery of the PD was use of an online system for resource sharing and asynchronous communication. I chose this approach to push teachers to develop empathy about what it is like to learn to use technology in learning, and to provide an example of how to use the particular technology to support instruction. I selected Schoology, a free learning management system (an online system for resource sharing, discussion, and tracking student progress) because it resembles Facebook, and is designed for ease of use (e.g., the page layout is simple and navigational cues are obvious). Twenty-two teachers attended the kick-off meeting, where teachers got to know each other and were introduced to the technologies and concepts central to the entire PD experience. At the meeting the teachers practiced using a demonstration course in Schoology by creating their own accounts, logging in, and navigating through the different elements of the online tool including: personal profile, blog page, discussions, and posted resources. They also had an opportunity to consider the different elements of TPACK and worked collaboratively to brainstorm opportunities for balanced and thoughtful technology integration. For about half the participants (those who were already proficient with this work), this was the only engagement with the PD. The two months that followed the face-to-face kickoff provided opportunities for the remaining teachers to participate in thematic online discussions in Schoology and tune in to two webinars that I included to ensure that participants who best benefited from synchronous interaction would feel their needs were met. The topics and activities as planned and completed are described in Table 1. Note that both the discussion and webinar for Topic 3 were not completed as planned. The goal of the online discussion activity in Topic 1, which happened in the week following the kickoff meeting, was to further develop Schoology skills gained in the kickoff meeting and to use Schoology to continue reflection and discussion on TPACK. After that week, Topics 2 and 3 were intended to introduce new concepts and were set up to follow the same pattern: 1) presenting resources that teachers might use in their classrooms, 2) facilitating online discussion about how the resources might be used, and 3) wrapping up the topic with a webinar. Participation in PD delivered as planned. There was moderate participation the PD activities in the first week of the online work; however, it fell of dramatically during the first month, diminishing to virtually no participation in month two. My goal had been to create and foster a CoP to allow opportunities for those with more knowledge to share with others using an online space that was new to everyone, providing an opportunity for even the more technologically inclined participants to gain new skills and knowledge. Table 2 shows the participation for the PD overall. 1 participant logged at least once. Participating in Schoology discussions. I had left the kick-off meeting with high hopes. Though several teachers from the Center had struggled with the Schoology login process, I felt that there had been enough activity by confident and proficient teachers to carry the momentum and spur rich discussion online. This was not the case. As you can see in Table 2, after the initial topic, only five participants returned for the online portion of the PD. In the first month of use, discussion forums were used by only a small number of participants, and this dropped off dramatically after the first month. Social presence in Schoology. An important point stressed early and often in the PD was the idea of building social presence within the online course. Social presence is defined as the degree to which one asserts or makes him or herself visible within an online forum (Aragon, 2003; Biocca, Harms, Burgoon, Interface, & Lansing, 2003; Palloff & Pratt, 2007). Palloff and Pratt (2007) described learning environments where participants have developed social presence by building profile pages, so I encouraged teachers to develop their Schoology profile page with information about their professional experiences and photos. I also encouraged blogging their reflections on the PD experience. Feeling noticed or noticeable in an online community motivates further participation, and if online participants feel connectedness they are more likely to collaborate and support both their own and their peers’ learning (Aragon, 2003; Palloff & Pratt, 2007). To measure social presence of my participants I relied on both a count of the blog posts and an evaluation of the completeness of the participants’ profile pages. In addition, I found data in the observational notes, the interview notes, and survey responses reflecting on participant opinions about developing social presence. Table 3 illustrates the degree to which participants made themselves visible in the Schoology site, showing the underdeveloped profiles of most of the participants. Not even half of the participants included a photo in their profile and many left the personal or contact information sections incomplete. Similarly, the blogging feature was underused. This and the low number of discussion posts previously described, reflected participant tendency to lurk rather than post information to the site. Indeed, participant efforts to build social presence were only a fraction of what they could have been. The webinars. The webinars were marginally more popular than the online discussion and blogs. We used an application called AnyMeeting, chosen because it was free and relatively easy to use. Looking back at Table 2 you can see that there were thirteen participants in the first webinar and only two in the second. The first webinar featured peer presentations on novel approaches to technology integration in ELL classrooms, including the use of iPads and apps and the use of digital cameras for the construction of language experience approach (LEA) stories (a strategy for builidng reading and writing proficiency through use of the retelling of personal experiences). The second webinar was to have provided an opportunity for teachers to hear about resources supporting use of mobile phones in classrooms, but the only teacher who logged in said she preferred to talk about website building, so she and the guest speaker spent the time doing just that. The low level of activity on the Schoology site after the first week indicated to me that the original PD plan was not suitable for the group of teachers present. I was especially concerned that most of the teachers from the Center had dropped out. Among them were teachers who had very little experience using technology in their own lives. After some reflection and discussion with the teachers and program leadership, I chose to emphasize work on learning about how to use technology rather than just employing the online technologies in the PD, hoping to simplify the experience for those who might have been overwhelmed by Schoology. To support this shift in goals, I added two in-person meetings for the teachers at the Center. At the meetings, I highlighted the materials and resources that had been posted on the Schoology site and gave the teachers time to practice logging in and to experiment with the site with my support. Teachers also conversed about their use of technology and when and how any of the resources they had seen could be integrated into their instruction. The meetings were part of a mandatory monthly staff meeting at the Center, so were attended by all ten of its participating teachers. The teachers engaged in lively discussion about technology use left the meetings with some concrete skills. What issues inhibited and/or supported the participation of teachers in PD with an online component? Review of my data and the PD description indicate several barriers to successful implementation of the PD as originally conceived: 1) inadequate time and resources to support the PD, 2) a lack of trust in the online space, and 3) a lack of shared priorities for PD. Because much of prior research supports the need for adequate time for successful PD (Jacobson, 2012; 2015; Vrasidas & Glass, 2007), the discussion that follows focuses on the two latter, more novel, findings. Trust is a critical element in sustaining learner participation in online learning spaces (Brookfield, 2006; Kelly, 2008; Ortner, 2010). I had designed the online space to be a supported, intimate, and bounded online community – a safe space for teachers new to using social media for their own learning to have a positive experience. However, this was not the case. Many of the teachers from the Center were unwilling to participate in an online CoP because they did not trust the security of the website and felt there was a strong likelihood of their privacy being violated. At the kick-off meeting, they articulated discomfort when asked to find a picture to post or to add descriptions of their personal or professional lives. Hence, they contested calls to build social presence and chose to not be ‘visible’ in the space. Smith and Sivo (2012) suggest that lack of online social presence has a negative impact on teachers’ perceptions about how easy it is to use an online tool, consequently discouraging its use. Hew and Hara (2007) suggest that the mental and physical effort required to log in is sometimes a barrier to participation. Both findings from previous research possibly explain the lack of participation here. Additionally, several of the Center teachers commented that they were reluctant to share because they were new to the use of technology for instruction and understood that others in the group had more experience. They were afraid of making mistakes and of being exposed as lacking expertise. Such comments shared during the kickoff meeting and heard by the more technologically experienced teachers may have been a disincentive for the latter group to participate. Hew and Hara (2007) write, “Sharing knowledge is an endeavor that demands the sharers’ time and energy. Thus, knowledge sharers should not be made to feel that the time and energy they spent have been wasted on seekers who are simply not keen to learn” (p. 592). I had been hired as a consultant by the leadership of the organization to support their goal of integrating more varied and complex learning technologies into classrooms. In their view, teachers needed to be pushed to try new technology so that learners would have an opportunity to experience technology use in the short time they are enrolled in programming. This begs the question – Whose priority was it to engage in the PD? Cassell and Johnson (2006) citing Park (1999) write, “Park (1999) argues that participatory research is motivated by action, and that the force that lies behind that action is a vision of what ought to be…” (p. 798). In this case, the vision was to support the development of the teachers into peer experts to facilitate on-going learning of members of the community. It was not likely, it seems, the intention of the teachers to become those peer experts. In this more critical view of the outcome of the PD, my assumption that teachers would engage in such interactions was likely flawed from the onset of the project. What the organization leaders and I were hoping to accomplish was a change in ways of being. We were asking teachers who were not used to using the internet to view it as a venue for collaboration. During the interviews, I learned that teachers from the Center had been required to attend the kickoff meeting. They had not volunteered, and because many of them possessed such limited technology skills, there was no chance that they could fully make use of the collaborative nature of the online component of the PD. Additionally, one of the focal participants commented, in her interview, that many of the resources recommended were not “immediately relevant” because it would have taken too long for her to develop the skills to actually use them, which diminished her motivation to participate. The most important implication or lesson learned here concerns the skills and experiences of the teachers invited to participate. As indicated previously there was a broad range of skill represented in the group. Successful CoPs require a convergence of competence, “a shared competence that distinguishes members from other people” (Wenger, 2006, p. 1). Given this wide range of skill and the evident failure of the Schoology site to become an accepted venue for collaboration, I suspect that a more homogeneously skilled group might have worked better. Further, a sense of belongingness is essential for such a community to develop. Brooks, (2010) writes that there should be “a shared faith that members’ needs will be met through their commitment to be together” (p. 263). I think because there was little “convergence of competence and experience,” in Wenger’s words, we did not accomplish building a community in this sense. Also significant was my positionality as facilitator. Furnborough (2012) writes of the importance of tutors not pushing students if autonomy in learning is to be preserved. In the same way, a facilitator should not push teachers into change that they are not ready to make. I had felt it important to include multiple and diverse opportunities for learning and interaction because learning happens best when there is an opportunity for meaningful authentic activities and peer collaboration. Hence, I used the opportunity to implement PD that promoted technology integration and provided incentives to encourage teachers to engage in lifelong learning. Though I thought I had created a professional development experience for a group of teachers voluntarily participating, it is possible that, in the eyes of most the teachers at the Center, I was actually there to support the agenda of the program leadership. This not only compromised my position as facilitator, it also complicated a primary tenant of action research, that those involved in the learning or change are key participants in the process. If I had responded more deftly and shifted my strategies earlier on with the teachers from the Center, I may have saved many of them from engaging in PD activities that many of them viewed as not relevant. When I think back I cringe at the embarrassment and futility some of those teachers must have felt being asked to create website accounts using email addresses they could not remember how to use. The big lesson for PD here is to meet teachers where they are. Help them use the skills they already possess and, gradually, encourage them to develop new skills. Aragon, S. R. (2003). Creating social presence in online environments. New Directions for Adult and Continuing Education, 2003(100), 57–68. Avison, D., Baskerville, R., & Myers, M. D. (1998). The structure of power in action research projects. In N. Kock (Ed. ), Information systems action research: an applied view of emerging concepts and methods. Springer. Biocca, F., Harms, C., Burgoon, J. K., Interface, M., & Lansing, E. (2003). Toward a more robust theory and measure of social presence: Review and suggested criteria. Presence, 12(5), 456–480. Brooks, A. K. (2009). Complexity and community: Finding what works in workplace ESL. New Directions for Adult & Continuing Education, (121), 65–74. Brooks, C. F. (2010). Toward “hybridised” faculty development for the twenty-first century: blending online communities of practice and face-to-face meetings in instructional and professional support programmes. Innovations in Education and Teaching International, 47(3), 261–270. Cassell, C., & Johnson, P. (2006). Action research: Explaining the diversity. Human Relations, 59(6), 783–814. Checkland, P., & Holwell, S. (1998). Action research: Its nature and validity. Systemic Practice and Action Research, 11(1), 9–21. Furnborough, C. (2012). Making the most of others: autonomous interdependence in adult beginner distance language learners. Distance Education, 33(1), 99–116. Hew, K. F., & Hara, N. (2007). Empirical Study of Motivators and Barriers of Teacher Online Knowledge Sharing. Educational Technology Research and Development, 55(6), 573–595. Jacobson, E. (2012). Adult basic education in the age of new literacies. New Literacies and Digital Epistemologies.Volume 42. New Literacies and Digital Epistemologies (Vol. 42). ERIC. Moore, H. (2007). Non-language policies and ESL: Some connections. TESOL Quarterly, 41(3), 573–583 CR – Copyright &#169; 2007 Teachers of En. Oquist, P. (1978). The Epistemology of Action Research. Acta Sociologica, 21(4), 143–163. Palloff, R. M., & Pratt, K. (2007). Building online learning communities: Effective strategies for the virtual classroom (2nd ed.). San Francisco: Jossey-Bass. Kindle file. Rubin, H. J., & Rubin, I. S. (2012). Qualitative interviewing: the art of hearing data. Los Angeles: Sage Publications, Inc.
Smith, J. A., & Sivo, S. A. (2012). Predicting continued use of online teacher professional development and the influence of social presence and sociability. British Journal of Educational Technology, 43(6), 871–882. Vrasidas, C., & Glass, G. V. (2007). Teacher Professional Development and ICT: Strategies and Models. Yearbook of the National Society for the Study of Education, 106(2), 87–102. Wenger, E. (2000). Communities of practice and social learning systems. Organization Articles, 7(2), 225–246. Williams, B. (2007). What teacher behaviors encourage one at-risk African-american boy to be a productive member of our classroom community. In C. Caro-Bruce, M. Klehr, E. Burmaster, K. Zeichner, & R. Flessner (Eds. ), Creating Equitable Classrooms Through Action Research (pp. 100–124). Thousand Oaks, CA: Corwin Press. In this article, Dr. Andreas Schramm draws on the research of his graduate students, colleagues, and from his own recent sabbatical to describe what makes the tense-aspect system in English notoriously challenging to teach and learn, and to show that it can nonetheless be explicitly taught. Drawing from his experience as an English learner and one-time English teacher in training, he shares anecdotes and practical tips to help English as a Second and Foreign Language teachers unpack the meaning of tense and aspect for their learners. Past and Progressive walk into a bar. It was tense. Teaching aspect is also challenging for native speaker teachers, who may find themselves resorting to contrived explanations that always seem to have exceptions. Teachers may contrast the simple present with present progressive by explaining that something happens regularly (“I shop every Monday”) as opposed to it happening right now (“I am shopping right now”). But what about “I live in St. Paul” vs. “I am living in St. Paul,” in which the latter also refers to some regular state of affairs, but somehow more temporary? Similarly, teachers may explain that we don’t use the progressive with emotions, such as “I love it,” but then comes along the McDonald’s commercial announcing, “I’m loving it!” Textbooks can also play a role in confusing the issue. While they offer explanations that can be useful for learners, from my observations, they often oversimplify. Teachers benefit from a more nuanced understanding of aspect, so that they don’t run into trouble when trying to teach it using textbooks. A long time ago in Germany, I was also on track to become an English teacher. In part because German expresses aspectual meaning differently than English, I wrestled with the progressive in English until becoming a linguist. Fortunately, your students can begin to unpack the meaning of aspect in English – without becoming linguists. By first presenting prior research literature and then describing three studies conducted by my graduate students, research partners, and myself, this research-based discussion will hopefully help you become a better “applied linguist” when it comes to tense and aspect, and will show how explicit instruction can help adult English language learners understand the meaning of aspect, specifically, past progressive and simple past. To set the stage for understanding this research, and to address some of what makes aspect so challenging to teach and learn, this section will describe the literature around two types of aspectual meaning in English, referred to in this article as grammatical and situational aspect. To explore the teaching and learning of aspect in English, it will then describe the literature around aspect acquisition. It will then address the question of implicit versus explicit teaching. For me, it all got started with a seminal article by the linguist Paul Hopper (1982). I already knew that the meaning of the progressive versus simple past (grammatical aspect) in English was complex. In this article, Hopper explains how in narratives, the plot (he calls it the foreground) is expressed in the simple past, while the setting and scenery (his background) is expressed in the progressive. This went beyond tense, or just past, present and future. It was time (no pun intended) that I understood tense and aspect. One way to explore the meaning of grammatical aspect is through narratives. We know that good narratives have a plot that causally connects all situations (e.g., van den Broek, 1988). The use of tense and aspect is one of the ways we create such causal connections in narratives. To explore this, let’s look at the short narrative below (adapted from Kivimagi (2013). An old pirate was sitting in the bar. He was smoking a pipe and drinking a glass of rum. He was wearing an eye patch, and he had a parrot on his shoulder and a wooden leg. Instead of his right hand, he had a metal hook. A young sailor was chatting with the pirate and he ASKED him about his adventures at sea. ‘So, how did you lose your leg?’, the young man ASKED the pirate. When the pirate was eating the grapefruit, presumably, the burning was caused either by the grapefruit squirting into the pirate’s eye or by the pirate accidentally rubbing his eye with his new hook. So what is the difference if we change “was eating” to “ate” in the highlighted sentence? What were the reason(s) for the burning? When we change “was eating” to “ate,” the reason must be something else, no longer connected to the grapefruit. The grapefruit is gone, so it couldn’t have caused the burning. Perhaps a piece of dust flew into the pirate’s eye. To understand what happens when we change “was eating” to “ate,” let’s look at the time periods in this story. There are three time periods in this and in any sentence: the utterance time, topic time, and situation time (see Figure 1). 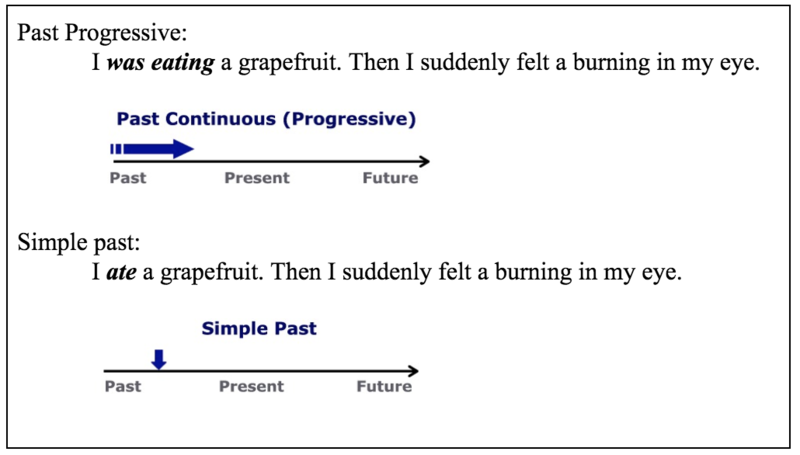 The difference between tense (present, past, future) and grammatical aspect lies in the different relationships between these three time periods (Klein, 1994). Tense is determined by the relationship between the time of speaking (U) and the time of the events in a story plot (T). In the sentence in Figure 2, the tense is past, because the utterance time refers to a topic time that came before it (see Figure 2). When grammatical aspect is used, the relationship between the time of events in the plot (T) and the time of some other situation (S) matters (see Figure 3). There are different kinds of relationships in the past progressive and simple past. In the progressive, only part of the situation is emphasized. Its beginning and end are excluded. The situation is uncompleted, or imperfective. The grapefruit is eaten only partly (See Figure 4). In the simple past, the relationship is different. The situation is completed, or perfective. The end point of the eating is emphasized. What can be tricky here is that we typically talk about the simple past as a tense, but it also doubles up as a perfective aspect. It is a tense in that it refers to the past, but it is also a perfective aspect in that it emphasizes that the grapefruit is gone; only the peel is left (see Figure 5). When a situation is completed, or perfective, there is another possibility: some time has passed since the situation’s completion. That is the case in the present and past perfect, which is beyond the scope of this article but can be further explored in Klein (1994). Pat walked to the park. Pat walked in the park. The differences in the time periods of these three sentences has to do with situation aspect (Vendler, 1957). We can use three descriptors to label these differences: 0-state (Pat was tall), 1-state (Pat was walking in the park), and 2-state (Pat was walking to the park) because of the time periods (=states) involved in each (Klein, 1994). Let me give you examples and reasons for each of them below. 0-state: refers to situations that don’t have a beginning or end point. They express permanent properties. For example, “Pat is tall” is a 0-state situation. There is no time when she changes from tall to not tall or is not tall (except her childhood, which is irrelevant for such a statement). By contrast, the sentence “Pat walked in the park” has a beginning point, at which she is getting into the park, and an end point, when she gets out of the park again. 1-state: refers to situations having a beginning and an end point. The sentence “Pat walked in the park” has such endpoints: the beginning and end of the walk. There were many times in her life when she was not walking and will not be walking. Test: As a test, we can easily say “Mother walked in the park for two hours.” There are plenty of times before and after Pat’s two-hour walk when she is not walking. This is different from her being tall when there aren’t such times during which she isn’t tall. 2-state: refers to whether a situation has a before and after contrast. There is an endpoint of one state and the starting point of another. The sample sentence “Pat walked to the park,” for example, has the logical or natural endpoint of getting to the park. It expresses a contrast between the state, or time period, before getting to the park and the state of after having gotten there. It is a 2-state situation. Test: We determine whether an event has two states (i.e., has a natural endpoint of the first state) by applying the following test question (Garey, 1957): “If Pat was walking to the park and was interrupted while walking to the park, has she walked all the way to the park yet?” If the answer is “no” (she has not gotten there yet), the contrast between the states (endpoint of the first state) has not been expressed. Therefore, the situation must have two states. By comparison, if we take the 1-state situation “Pat walked in the park,” and we apply this test, the answer will be “yes.” See for yourself: “If Pat walked in the park and was interrupted while walking in the park, has she walked in the park yet?” Certainly we can say that Pat has walked already (even if she hasn’t finished her walk). This situation does not have a before and after contrast and is therefore not a 2-state situation. No wonder it’s difficult to learn aspect! It is challenging to understand it, and therefore to explain and teach. The explanation given above helps explain the oddity of the well-meaning English teacher’s explanation of “The sun was shining/ The sun shone.” Using the simple past in “The sun shone” implies a before and after contrast characteristic of the perfective. Because “shine” is a 0-state verb, without a clear beginning or endpoint, this before and after contrast is awkward. Similarly, this sheds light on why the explanation that “we use the simple present to talk about habitual actions and the progressive for actions taking place ‘right now’” sometimes works, and sometimes does not. It works with 1-state verbs with a clear beginning and end point, such as “shop.” We can confidently explain to learners that we use the simple present, “I shop (every week)” to describe a habitual action and “I am shopping” to describe an action happening right now. However, this explanation breaks down with 0-state verbs. As we saw in the introduction, it doesn’t work well to distinguish “I live in St. Paul (every week)” vs. “I am living in St. Paul (right now)” because in this sentence, “live” functions as a 0-state verb. It has no endpoints and expresses a longer time period than a 1-state verb. Thus it works just fine to use either the simple present “I live in St. Paul” (=permanently) or the progressive “I am living in St. Paul” (=temporarily). We will next talk about learning aspect and teaching it. In teaching aspect, we must also consider the learner and her stage of tense-aspect development. In the earliest stage of tense-aspect acquisition, the pragmatic stage (Meisel, 1987), a learner relies on extralinguistic resources (e.g., conversational turns). This learner also relies on a universal ordering principle of events, telling events in the order in which they happened. Next, in the lexical stage, learners employ time adverbials and connectives (e.g., “before,” “and then”) so she does not have to rely on the universal order of events. In the final stage, the morphological stage, time content is expressed by successively refining the grammatical tense-aspect system alongside adverbials. In the morphological stage there is another challenge. The use of morphological forms also changes with each communicative task (von Stutterheim & Klein, 1989). For example, in recounts, main events are in the past tense, while less important events are backgrounded using the progressive. And in academic writing, the present signals agreement with a statement, past indicates disagreement, and present perfect means partial agreement (Schramm, 1996). Thus, verbal tense-aspect forms have to be redefined, and thus relearned, within each new context, especially considering that aspect use is distributed unevenly across contexts, such as using the progressive with emotions or politeness (Römer, 2005), e.g., “I’m feeling great” or “would you be willing”. Some researchers therefore use the “meaning-oriented approach” to study language acquisition, which investigates meanings and their associated forms (Bardovi-Harlig, 2014). This approach has yielded the developmental insight that language learners first use perfective aspect together with 2-state situations (Pat walked to the park) (Aspect Hypothesis; e.g., Andersen & Shirai, 1996) for discourse foregrounding (e.g., describing the plot) (Interlanguage Discourse Hypothesis; e.g., Bardovi-Harlig, 2000). Only later do they use imperfective aspect connected with 1-state situations (Pat is walking in the park) for backgrounding (e.g., describing setting and scenery). This meaning-oriented approach has also been the backdrop for our research. And, while much second language aspect research focuses on production (e.g., Andersen & Shirai, 1996), we focus on reading comprehension to emphasize understanding the meaning of aspect. Learners’ first languages also must be taken into consideration in the acquisition of aspect. Some languages have morphosyntactic markers (visible markers on a word or in the structure of a sentence) for aspect, while others do not. English, for example, uses morphological endings (-ed, -ing) and syntactic phrases involving a form of be or have in the expression of aspect, as in “was eating.” In our study of Arabic learners of English (Schramm & Mensink, 2016), speakers of a language without morphosyntactic aspect, learners were found to struggle with aspectual meanings within English narrative texts. While a following study of Spanish speakers (Riddle, in press) found similar struggles among native Spanish speakers after finishing reading English narrative texts, it also found that while reading, Spanish speakers’ understanding of aspect resembled young adult native English readers (Becker, Ferretti, and Madden-Lombardi, 2013; Schramm & Mensink, 2016). The latter was not evident in Arabic speakers and may be due to transfer from Spanish. Our research has taken an explicit approach to teaching aspect. Thus, it is helpful to understand explicit and implicit teaching in Second Language Acquisition (SLA). The role of input has been a central concern in SLA research for over 40 years (e.g., Han & Tarone, 2014). Successful language acquisition appears to require a combination of implicit and explicit instructional input. Grammar-oriented form-focused instruction and communicative language teaching need not be mutually exclusive (e.g., Nassaji, 2000). In fact, most teachers value the practice of blending these approaches because it elicits, enhances, and combines the grammatical and sociolinguistic aspects of language (e.g., Long, 1991; Swain 1995). Several strategies have been proposed to combine implicit and explicit instruction through input enhancement, or intervention used to direct learners’ attention to language forms (Sharwood Smith, 1991) and thus raise learner consciousness of the input. One of them is textual enhancement, which is an approach that combines implicit communicative and explicit form-focused input by embedding typographical cues such as highlighting in texts (Rutherford & Sharwood Smith, 1985). The goal is to increase learners’ likelihood of paying attention to relevant features of second-language input. In our research, we combine input enhancement with explicit teaching alongside meaningful communication (Long, 1991) to draw learners’ attention to and notice targeted linguistic forms and their meanings (e.g., Leow, 2015). Here is what one of the enhanced texts from instructional interventions in our research looks like. 1 Shelley was visiting her grandparents in Northern Minnesota. 4 leaves beginning to turn. 5 The road was empty except for this slow poke in front of her. 6 Impatiently, she PASSED/was passing the pickup. 8 forcing her to yank the steering wheel to the right. 9 Within split seconds, several thoughts raced through her head. 10 The car belonged to the company her dad works for. 11 Would she get in trouble for taking it without asking? 12 Would he punish her by not letting her use his car again? 13 She felt a strong bump. In a study using implicit instructional interventions with college prep learners with mixed first languages, when no textual enhancements were used, learners appeared not to notice the meaning of aspect (Schramm, 2012). By contrast, when using textual enhancements of aspectual forms with texts like that pictured to the left, textual enhancement appeared to prompt awareness of aspectual meanings among university freshmen non-native English speakers (Meidal, 2008). Learners in both of these studies presumably were on the morphological stage of acquiring tense-aspect meanings (Meisel, 1987). Thus textual enhancement may be a possible teaching strategy at this developmental stage for triggering noticing of aspect. Further studies combining textual enhancement with explicit teaching are described below. This section will summarize the major findings of three successive studies conducted by advisees, research partners and myself. These studies and related materials can be viewed on my website by early 2018 (https://works.bepress.com/andreas-schramm/). Two of these studies were Midwestern classroom studies conducted by my graduate students. Sample sizes were relatively small, and first languages were mixed. The third carefully controlled, large-scale follow-up study was conducted during my recent sabbatical in Germany with 91 participants and first language accounted for. Two German colleagues and myself conducted this study with design and statistical support from a U.S. colleague. All three studies found that adult English language learners who were presumably on the morphological stage of aspect acquisition (based on their English proficiency and information from their instructors) showed an overall increased understanding of the causal meaning of the progressive (imperfective) aspect in sentences like sentence (6) in Table 1 after one explicit teaching intervention. Additionally, the final large-scale study found that understanding increased not only when reading narratives with causes and surprise effects (as in Table 1), which were the vehicle for teaching this meaning in the intervention, but also in a general way (with shorter narratives without surprise effects). Not only grammatical aspect, but situation aspect was controlled in the stories. They were designed to consistently use causal sentences with 2-state situation aspects that have explicit endpoints. Because of their emphasis on before and after contrast, 2-state verbs are most clearly uncompleted in the past progressive and most clearly completed in the simple past. The Questions. Each of these three studies investigated whether explicit instruction of aspectual meaning as related to causal inferencing, combined with textual highlighting, could help learners make causal inferences based on aspect in narrative texts. The Settings. The first two studies took place in Midwestern classrooms – college and Adult Basic Education (ABE) – with adult learners. The third large-scale study took place at a large public university in Germany. The Participants. Participants in the Midwestern classroom studies were all adults who had English proficiencies of at least 80 on the IBT/TOEFL (L. Beling, personal communication, November 2011) or a reading proficiency of at least a 5.0 and a language proficiency of at least a 4.5 on the Test of Adult Basic Education (between fourth and fifth grade in the K-12 educational system). Participants in the second study ranged in age from 25 to 61 and represented the following native languages: French, Vietnamese, Telugu, Spanish, Nepali, and Chinese. This information was not tracked in the first study. The 91 participants (60 instructed; 31 uninstructed) in the German study were native German-speaking novice teacher candidates of high-advanced English proficiency (TOEFL 500-550). The Teaching Interventions. All three studies used a variation of the following procedure. Differences between the procedures had to do with how many texts were used in the pre-test, guided practice, and post-test, ranging from three to eight in each. The materials used to complete these studies can be viewed here: https://works.bepress.com/andreas-schramm/27/. Finally, the students took the post-test. During the grammar instruction each study presented an explicit grammar lesson on the meaning of imperfective and perfective aspect. These lessons consisted of a metalinguistic explanation of aspect focusing on the perfective and imperfective meanings themselves and their use in narratives. They also included an explanation of textual enhancements. Students were taught that the perfective starts and ends, and that the imperfective starts and is not necessarily done. The lessons included graphs on the definitions of the perfective and imperfective. Examples of the graphs used are in Figure 6. The grammar instruction in the third study also used Figures 1-5 above. During the modeling and guided and independent practice on how to use the perfective and imperfective in context, stories were used like the sample in Table 1. With the guided and independent practice, students received a narrative in either the perfective or imperfective aspect. Wytaske’s study (2016) collected additional post-test data 30 days after the post-test both while reading and immediately after participants’ finished reading to see if the new understanding of aspect was retained. Schramm & et al.’s (2017) large-scale German study collected delayed post-test data (as in Wytaske’s study), approximately four months after the post-test also both during reading and after participants finished reading. This delayed post-test data is still being evaluated and can be viewed on my website by early 2018 (https://works.bepress.com/andreas-schramm/). In Kivimagi’s (2013) study, while reading, destabilization occurred in what participants already knew, based on the pre-test, about the simple past. In Wytaske’s (2016) study destabilization of the imperfective meaning of aspect occurred after finishing reading stories 30 days after the instruction. It was still fairly good while reading. Thus her instruction improved the understanding of progressive aspect, but more strongly in the short term than in the long term. In Schramm et al.’s (2016) large-scale German study, during reading, participants’ understanding of the causal meaning of progressive aspect increased when compared to the pre-test. However, they also identified perfective situations as causes more than they identified imperfective (progressive) situations. The destabilization in all three studies occurred while reading. This is not surprising since they were using cognitive short-term memory resources while reading (e.g., Magliano & Schleich, 2000). This destabilization is also predicted by the Aspect Hypothesis, which states that language learners first use perfective aspect together with 2-state situations like in our stories (e.g., Bardovi-Harlig, 2000). While this destabilization may appear to show regression, it is common – things often get “worse” before they get “better” during instruction of new information (Bardovi-Harlig, 2000). While the delayed post-test data in my German study is still being analyzed, Wytaske’s (2016) delayed post-test data suggests that aspect acquisition, with just one intervention, decreased somewhat over time. Not surprisingly, repeated follow-up instruction seems required for a long-term change in reading. While we knew from the previous studies with narratives that learners were showing an increased understanding of the imperfective meaning of progressive aspect in the context of the two-cause surprise-effect narratives that we used in our instructional intervention, we also wanted to know if participants gained a more general understanding of the meaning of grammatical aspect after the intervention. Thus, in addition to collecting post-test data on the acquisition of the causal meaning of aspect, we used shorter versions of such stories, without surprise effects, to measure whether direct instruction improved general understanding of the imperfective (uncompleted) meaning of aspect. In the pre-test, learners started out (and finished) with an overall strong understanding of the completed meaning of the perfective simple past. This follows the Aspect Hypothesis (because our study used 2-state verbs). In the post-test, after instruction, however, learners showed a greater increase in understanding of the uncompleted meaning of the imperfective (progressive) than the perfective meaning. This is counter to the Aspect Hypothesis, suggesting that the understanding of imperfective may not be set in stone, and can be impacted by direct meaning-based instruction. It is important to note that the control group without meaning-based instruction also showed some increase in understanding of the perfective and imperfective meaning of aspect over the course of a semester, though significantly less. This is not surprising since presumably they received some instruction on aspect in their classes, but did not receive the explicit meaning-based instructional intervention. Results from this part of the study also suggest that the explicit meaning-based teaching in the intervention (Bardovi-Harlig, 2014) is effective compared to the presumably traditional, form-based teaching methods of the control group (e.g., Leow, 2015), based on anecdotal information from instructors and students about how aspect is typically taught. Thus, the impact of explicit meaning-based teaching on aspect development should be explored further. The meaning of progressive aspect (Klein, 1994) – in the first three studies, at least the causal meaning connected to its uncompleted nature (Schramm & Mensink, 2016) – appears possible to teach explicitly in meaningful contexts with successful initial understanding. This confirms the literature on explicit teaching alongside meaningful communication (e.g., Leow, 2015; Long, 1991; Nassaji, 2000). As we’ve also seen in the study without surprise effects, explicit, meaning-based teaching appears helpful for increasing general aspect understanding, supporting a meaning-based over a form-based approach to teaching aspect (e.g., Bardovi-Harlig, 2014). For long-term understanding, more instruction over time seems to be required. Teaching aspect is not a one-time shot. It will require syllabus design that keeps cycling through the information and reinforcing it. While many studies focus on the production of aspect in English (e.g., Andersen & Shirai, 1996) – and this is important for adult English language learners who are studying English for Academic Purposes (Schramm, 1996) – these studies suggest that reading comprehension of aspect may be useful for acquisition (Schramm & Mensink, 2016). Since comprehension often precedes production (Towell, 2013), it may be good to first teach the meaning of aspect in the context of text-enhanced reading (Rutherford & Sharwood Smith, 1985). When teaching aspect, keep in mind that things sometimes get “worse” before they get “better” and what appear to be temporary setbacks can be testimony to being in the process of learning (Bardovi-Harlig, 2000). The acquisition of aspect does not appear to be linear and may need sustained follow-up to stabilize. As we can see from these studies, all the nuances of aspectual meaning do not need to be explained to learners as part of explicit instruction for them to increase their understanding. Teachers can simplify explanations to fit their learners and contexts, knowing that their learners will likely never have to talk about sunshine being completed. However, by understanding more about grammatical and situational aspect (Klein, 1994; Vendler, 1957), teachers can be aware of the limitations of simplified explanations as well. Depending on learners’ needs, teachers may also want to explore in what contexts exceptions come up, such as using the progressive for politeness or with emotions (Römer, 2005), including to create a sense of immediacy (Swales & Feak, 2012), for example, in advertisements (“I’m loving it!”). A field trip to McDonald’s may be a great start! Andersen, R. & Shirai, Y. (1996). Primacy of aspect in first and second language acquisition: The pidgin/creole connection. In W. Ritchie & T. Bhatia (Eds), Handbook of Second Language Acquisition (pp. 527-570). San Diego, CA: Academic Press. Bardovi-Harlig, K. (2000). Tense and aspect in Second Language Acquisition: Form, meaning, and use. Malden, MA: Blackwell Publishers. Bardovi-Harlig, K. (2014). Documenting interlanguage development. In Z.-H. Han & E. Tarone (Eds. ), Interlanguage: Forty years later (pp. 127-146). Amsterdam: John Benjamins. Becker, R. B., Ferretti, T. R., & Madden-Lombardi, C. J. (2013). Grammatical aspect, lexical aspect, and event duration constrain the availability of events in narratives. Cognition, 129(2), 212–220. Garey, H.B. (1957). Verbal aspect in French. Language, 33, 91-110. Han, Z. & Tarone, E. (2014). Interlanguage: Forty years later. Amsterdam: John Benjamins Publishing Company. Hopper, Paul. (1982). Aspect between discourse and grammar. In P. Hopper (Ed), Tense-aspect between semantics and pragmatics (pp. 3-18). Amsterdam: John Benjamins. Klein, Wolfgang. (1994). Time in language. New York, NY: Routledge. Leow, R. 2015. Explicit learning in the L2 classroom: A student-centered approach. New York & London: Routledge. Long, M. H. (1991). Focus on form: A design feature in language teaching methodology. In K. de Bot, R. Ginsbert, & C. Kramsch (Eds. ), Foreign language research in cross-cultural perspective (pp. 39-52). Amsterdam: John Benjamins. Magliano, J. & Schleich, M. (2000). Verb aspect and situation models. Discourse Processes 29: 83-112. Meisel, J. (1987). Reference to past events and actions in the development of natural language acquisition. In C. Pfaff (Ed.) First and second language acquisition processes (pp. 206-224). Cambridge: Newbury House. Nassaji, H. (2000). Towards integrating form-focused instruction and communicative interaction in the second language classroom: Some pedagogical possibilities. The Modern Language Journal, 84(2), 241-250. Robinson, P. (1996). Learning simple and complex rules under implicit, incidental rule-search conditions, and instructed conditions. Studies in Second Language Acquisition 18, 27-67. Römer, U. (2005). Progressives, patterns, pedagogy: A corpus-driven approach to English progressive forms, functions, contexts, and didactics. Amsterdam: J. Benjamins Pub. Co.
Rutherford, W. and Sharwood Smith, M. (1985). Consciousness-raising and universal grammar. Applied Linguistics 6, 274-282. Schramm, A. (1996). Using aspect to express viewpoint in EST texts. English for Specific Purposes 15, 141-164. Schramm, A., & Mensink, M. C. (2016). Processing of aspectual meanings by non-native and native English speakers during narrative comprehension. In O. Timofeeva, A. Gardner, A. Honkapohja, & S. Chevalier (Eds), New approaches to English linguistics: Building bridges (pp. 251-280). Amsterdam; Philadelphia: John Benjamins Publishing Company. Sharwood Smith, M. (1991). Speaking to many minds: on the relevance of different types of language information for the L2 learner. Second Language Research 7, 118-132. Swain, M. (1995). Three functions of output in second language learning. In G. Cook & B. Seidlhofer (Eds. ), Principle and practice in applied linguistics: Studies in honour of H. G. Widdowson (pp. 125-144). Oxford: Oxford University Press. Swales, J. & Feak, C. (2012). Academic writing for graduate students: Essential tasks and skills. New York & London: Routledge. Towell, R. (2013). Learning mechanisms and automatization. In J. Herschensohn & M. Young-Scholten (Eds). The Cambridge handbook of second language acquisition (pp. 114-136). Cambridge: Cambridge University Press. van den Broek, P. (1988). The effects of causal relatedness and importance of story events. Journal of Memory and Language 27, 1-22. Vendler, Z. (1957). Verbs and times. Philosophical Review 66, 143-160.
von Stutterheim, C. & Klein, W. (1989). Referential movement in descriptive and narrative discourse. In R. Dietrich & C. Graumann (Eds. ), Language processing in social context (pp. 39-76). Amsterdam: Elsevier Science Publishers. Drawing from her professional development work with the Associated Colleges in the Twin Cities and her research background with the National Center for the Study of Adult Learning and Literacy (NCSALL), developmental psychologist Dr. Nancy Popp discusses how understanding adult development can help educators support adult English language learners. Fifty years ago, it was assumed that by the time we reached 20 or 21 years of age, we had achieved all of our adult faculties and any continued growth was about age and weight. Fortunately, the field of adult development (and Constructive-developmental theory in particular) is, like its subject, actually continuing to grow and to teach us some surprising—and hopeful—lessons. The importance of the Constructive-developmental (C-D) theory of adult development in its application can be profound, including for adult English Language Learners (ELLs) and their teachers. It is a particularly clear lens—and mirror—through which we can sharpen our vision and soften our understanding of our students, each other, and ourselves. When we talk about development it gets personal—we inevitably start thinking about our own place on the continuum, or where somebody else is, and there is a real temptation to start judging ourselves, others, or the theory. The spirit and soul of C-D theory is not about judging anybody or anything. It is about developing a deeper understanding of our students and ourselves so that we might work more effectively with them and each other. This article will introduce C-D theory and the developmental continuum it describes. It will look at the process and evolution of meaning-making and the implications of and applications to our work with adult ELLs. Theories not only describe and make sense of the world we see, but they also shape and frame the ways in which we look at the world (Edwards, 2009). Theories calibrate the radar of our awareness, attuning us to what we look at and what we look for (McGuigan & Popp, 2016). C-D theory calibrates our awareness to pay attention to a different kind of diversity than those most observable in the adult English language classroom: that is, to the differing ways that individuals make sense of their experience. C-D theory brings together two very big ideas in psychology (Kegan, 1980, 1982) that have also influenced education (Fosnot, 2015). They are constructivism, which looks at the ways in which we construct our reality, i.e., make sense of it; and developmentalism, which looks at the ways in which our construction of our reality changes and becomes more complex over time. In doing so, C-D theory maps a unique terrain in human psychological functioning and experience. The C-D theory of adult development is related to Piaget’s (1952, 1954, 1970) work with the developmental stages of reasoning of children. Piaget was particularly interested in when children came up with the “wrong” answer. He noticed some interesting patterns in their “incorrect” reasoning and began to look more closely at how children made sense of their world—looking beyond what they know to how they know. Kegan’s (1982) C-D theory expanded Piaget’s work on the cognitive stages of development in children in two important ways: in length and in breadth. He expanded breadth-wise to include social/interpersonal and emotional development as partners with cognitive development in how we know. And he expanded length-wise into adulthood, to include (at least) two major stages beyond Piaget’s formal operations—post-formal operations and post-post-formal operations. C-D theory gives us insights into the shape of our students’ understanding and misunderstanding to shed light on how they know and learn and not just what they know and learn. C-D theory shows us the hidden logic in our own and our students’ reasoning—even, and especially, when our answers seem to be “wrong.” Understanding our students’ reasoning is about listening carefully enough so that we really hear their own logic in how they put their world together. So it’s about understanding—but it’s a different kind of understanding. It’s not about the content—or storyline—of your student’s experience. It’s about their meaning-making—the ways they make sense of the content. And the ways they make sense of their own experience has everything to do with who they experience themselves to be. When you understand the way a person makes sense of her experience, you get a lot closer to understanding that person’s sense of identity—as an adult learner, an immigrant, a non-native speaker, working hard to get ahead. The same “content” or event can mean very different things to different people, depending on the complexity of the ways they make sense of it. Sometimes these distinctions are easier to see in kids. It’s like a mom with two kids: one is three and the other is nine. She’s giving them brownies after lunch, and the nine-year-old gets two. Of course the three-year-old instantly wails in protest that she wants two, too. The mom tries to reason with her, saying Tommy gets two brownies because he is bigger and when Zoey is as big as Tommy, she will get two brownies, too. It doesn’t work. Zoey wails louder and louder. The mom, at her wits end, says, “Ok, you want two, I’ll give you two!” and she swoops down with a knife and cuts Zoey’s brownie in two, and says, “There! You have two!” and Zoey beams with delight—while the mom and Tommy stare at each other in disbelief. So, that will only work for so long. It would never work with Tommy, and it will never, ever work with your teenager or with your spouse or your adult students. But the principles are the same with our development into adulthood. It’s about how differently Zoey and Tommy and your students put the world together. C-D theory looks at the complexity of the different ways people make sense of their experience, the ways they make meaning in and from their experience. Complexity in this context is about the kinds of perspectives people can take on their own experience. Zoey can consider only one aspect at a time—that two is more than one. Tommy knows that cutting something into two pieces increases the number of pieces but does not increase the overall quantity or amount. Tommy can take a perspective on his perceptions, and can consider two different aspects—size and number—at the same time. As we become more familiar with the qualitative distinctions between the ways that our students make sense of their learning, their teachers, their struggles and their successes, we begin to see more clearly how the same “content” takes on very different meaning. These differences in how we make sense of the same things has huge implications for how we all learn, and how our students learn—how they make sense of education, how they make sense of you as a teacher, how they make sense of themselves as learners and what their responsibility is in their own learning process. Some of your students will see you as the fountain of all they want to know and believe that your job is to hand it over to them. Some of your students will see you as the expert, the one who will impart not just facts, but understanding. You are the one who will tell them how to understand things that are ambiguous and confusing. You are the one who will tell them how and what to think and why. And some of your students will challenge you and ask why they should believe what you say, or what about this other way of thinking, or how do these two competing things make sense. You are likely to have all of these students in your classrooms. Let’s look briefly at the developmental process itself. It is important to understand that this kind of development is not a stair-step progression. The stages build on each other, so none can be skipped. It’s more like climbing up a mountain than a set of stairs—there are plateaus, valleys, steep and rocky trails—and breathtaking new views that show you new worlds and alter your experience of reality. The basic idea of this developmental process is that what we are “subject to” in one stage becomes what we can take as “object” in the next stage. For more information on the subject-object nature of development, see Kegan (1982). Meanwhile, let’s look at one of the most important principles of development—the holding environment. Developmental growth does not happen in a vacuum, but in the ongoing interactions between the individual and his or her social world (Baldwin, 1906, 1975; Darwin, 1968; Maturana & Varela, 1972; Piaget, 1954, 1952, 1970; Vygotsky, 1978; Winnicott, 1965). One of the fundamental tenets of C-D theory is that you can’t understand a person separately from his or her holding environment (Baxter Magolda, Creamer & Meszaros, 2010; Belenkey, Clinchy, Goldberger, & Tarule, 1986; Kegan, 1982, 1994; McGuigan & Popp, 2007, 2012, 2016). We are social creatures, and so are always in relationship with our social contexts—our families, jobs, faith communities, neighborhoods, classmates, or sports teams. We learn early on in our families what it means to be a good member of that family—which behaviors are okay and which behaviors will get punished—”We don’t throw food at each other in this family!” Our behavior and our values are shaped by our social contexts. We are products of our environments. Kegan (1982) further defined the holding environment, suggesting it has three functions: holding on, letting go, and sticking around. This means that a good holding environment, a classroom, say, will hold on to the student by supporting her where she is—validating and encouraging her current way of making sense of her world; will let go of the student by gently pushing on and challenging her current meaning-system; and will stick around by remaining in place for her to come back to as needed. Developmental growth requires an optimal balance of challenge and support from our holding environments. Too much challenge and not enough support leaves us feeling defeated and overwhelmed, and we do not grow. Too much support and not enough challenge leaves us feeling bored and restless, and we disengage and do not grow. An optimal balance leaves us feeling curious, stimulated and motivated. Non-native speakers trying to learn the local language very often find themselves over challenged and stressed in their new lives, and deeply grateful for the safe haven—the holding environment—offered by their English class and cohort there (Kegan et al., 2001). A holding environment like the classroom provides adult learners with a reliable time and space in which they can focus on their learning as learning, where they are expected to make mistakes and celebrate the successes. In my observations of and participation in this growth process over the years, including with adult English language learners (Kegan et al., 2001; McGuigan & Popp, 2016; Popp & Portnow, 2001), I have noticed that when given an opportunity to stretch and extend one’s mental reach, there seems to be an intrinsic urge to go for it. We don’t question this in little kids—their excitement when they can do something new is evident and infectious. We celebrate those achievements because we can see how much it means. While our adult expression might be more restrained, we still very often feel the same excitement when we achieve a hard-won victory—being able to say no and advocate for ourselves, finding our own voice after feeling invisible and powerless, or even just being able to read a menu and order in a new language. Those are developmental achievements that feel just as important and just as liberating as a one-year-old learning to walk. It feels good to grow! A good holding environment provides all of the necessary ingredients for those achievements. There are identifiable signposts and markers along the adult developmental journey to guide and map where we are. We call these markers mindsets, or meaning systems, and they signify qualitatively different perspectives and ways of making sense of where we are. Kegan (1982) identified six such markers from infancy to mature adulthood. We will look at only three of them—the three that occur most commonly in adulthood, and the ones that we are most likely to encounter in our adult learners (Baxter Magolda, 2009; Kegan, 1982, 1994; McGuigan & Popp, 2016; Torbert, 2004). While it can be tempting to view mindset characteristics as cultural differences, research to date has found clear evidence of these mindsets in diverse non-Western adult populations (Lindsley, 2011; Villegas-Reimers, 1996), and among ABE and community college ELLs (Kegan et al., 2001; Ouellette-Schramm, 2016). The following mindset descriptions and illustrations have been adapted from Popp & Portnow (2001). Self is defined by a very concrete orientation to the world and to one’s self-interests; by one’s concrete needs, purposes, plans, wants, and concrete characteristics such as nationality, likes and dislikes, age, religion, what kind of job one has, how many children, etc. Dualistic thinking such as right vs. wrong, and arbitrary either/or distinctions. Others are seen as either pathways or obstacles to getting one’s concrete needs met. For example, “if you like me, there’s a better chance that you’ll help me get/do what I want. If you don’t like me, you won’t help me get what I want.” Relationships are valued for these reasons. Interactions with others are understood in terms of their concrete elements (the facts of what transpired), the concrete give-and-take (what I help you with, what you help me with), and concrete outcomes (I get a better grade/job/salary). Strong reliance on rules to know how to accomplish something and to do it the right way. Criticism is experienced as being told I did it wrong and I am bad. Learning and education is about getting information, facts, and skills. A good teacher is the owner and imparter of necessary information and facts. Here is how one adult learner (Kegan et al., 2001) with an Instrumental meaning system responded when asked to talk about the ways that other people are different from her and what that means to her. Statements in bold type highlight the essence of this mindset. You have an idea but another person has an idea and can help you. Is a good idea, it can help you change. . . . Sometimes I have discussion with other students. You give your opinion. I give my opinion, they give their opinions. Sometimes I discuss . . . If you like that you can take something, something good you take it. Intolerant of ambiguity. Needs a clear sense of what others expect and want from him or herself. Reliance on external authority, identity group, and important others for values, acceptance, belonging, and sense of self. Education and learning is about learning new ideas to expand what I know so I can be more of an expert in my field. A good teacher is the expert, the authority on the subject who teaches me what he or she believes I need to know and understand. Well, American students are different than international students. The international students came from different cultures and understood each other. The American culture is different. So we share the same thinking about American culture, that it’s different than we came from. So that makes us to connect and to relate to each others. We have the same feelings. 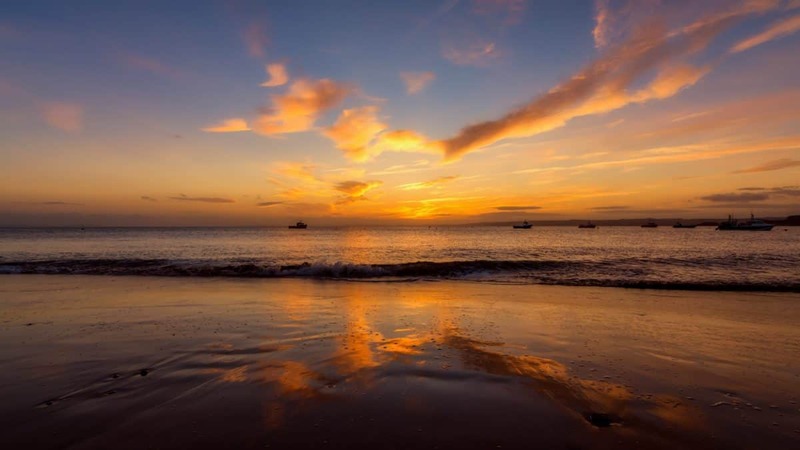 The orientation in the Socializing Mindset is toward a sense of belonging, of connecting around similarities with each other and feeling a common sense of identity and purpose. An individual with this meaning system is driven by, among other things, the need to be understood by, connected to, and identified with a person, group, philosophical, or religious stance. Feeling this sense of belonging and identity with a class or cohort can be an especially powerful experience for an adult learner with this mindset, and can often make or break his learning experience and success. An adult learner with a Self-authoring Mindset can often be recognized by a clear and well-defined personal agenda and set of goals that she brings to her classes. She will be interested in many different perspectives and could very well challenge her teachers on what is being taught and why. Self is defined by its own internal authority, value system, self-standards. Holds contradictory feelings simultaneously. Self can disagree with itself, feel two or more contradictory or competing things at the same time. Integrates others’ perspectives, including criticism, as one perspective among many. Evaluates and uses critical feedback and other perspectives as helpful information about the integrity of own self-system. Others are experienced as being responsible for their own feelings and thoughts and having their own psychological agendas and standards. Differences with others are experienced as a given, are appreciated and taken as opportunities for growth and creativity. Education and learning is about engaging new ideas to challenge my own, to expand my thinking, and challenge my assumptions. A good teacher is a knowledgeable person in the role of teaching others, presenting new ideas, new ways of thinking, and challenges assumptions. I leave [Even Start] last year…I transfer to the other program… but I don’t like what they teaching, no…because I saw [it was] back too down. [It was too simple?] Yes . . . and when I went there . . . this is what it looked to me like wasting time and I left. . . [I was learning more at Even Start] . . . yes, we studied social studies, science, history . . . [You wanted more information about subjects, than just about reading and writing?] Yes, exactly, that’s it . . . [At Even Start] we have different nationalities there, you know, from Africa, from the Caribbean, from Europe, even from United States . . . So we look like United Nations there. That was wonderful . . . studying different cultures, different history, what it is exactly the people, how they live in different areas . . . Yes, we all of the time talk about culture, especially what is the government of the country, how they are run, what they do. A person with the Self-authoring meaning system orients to his own internal authority in relation to the context(s) in which he finds himself, as this man did in choosing a learning environment better suited to his own learning goals. The goals set by someone with this mindset reflect one’s own values, standards, agenda, and are conceived out of an understanding and experience of oneself in relation to the social and political and environmental worlds one moves among. For this learner, the diversity of the class he chose and the wealth of information available in the wide range of experiences and origins of the other students was the most valuable part. He not only appreciated the differences between the other students and himself and their cultures—he sought them out, finding more opportunities to learn from the differences rather than needing to find the similarities. These have been very brief descriptions of the three primary mindsets that we find in adulthood, and despite the absence here of a discussion about the transitional journey from one to the next, there is a predictable and gradual process of evolution (Kegan, 1982; Popp & Portnow, 2001). Hopefully these descriptions of the different mindsets and their experience of learning have resonated with your own experiences with your students, and maybe even sparked insight into some of the struggles they have that have puzzled you. In the next section, we will look at what understanding these mindsets can mean for teaching in developmentally diverse classrooms. What do you do when your classroom is filled with people with all these diverse agendas and ways of making sense of you and of their learning? Most likely, you already intuitively do this every day. When your students don’t understand what you are asking them to do, you most likely inquire as to where they get stuck. We create social learning contexts in our classrooms with the intention of helping our students grow. Most often we focus on what we are teaching—those facts and skills that we know our students need to know to be able to navigate successfully in their communities. C-D theory gives us the added awareness to attend not only to what they learn but to how our students learn and how they know. When we ask our adult students to analyze a particular paragraph in English, for example, we may do so with the assumption that they can do this in their native language, that they know what it means, that they can look at a paragraph and pull out the main idea. But not all of them can—and very often it is not because they are not smart or curious enough, and not only because of difficulty with the language (Helsing, Broderick, & Hammerman, 2001; Kegan et al., 2001; Ouellette-Schramm, 2016). Very often it has a lot to do with the mismatch between what we are asking them to do and the complexity of their meaning-system to engage it (Kegan, 1994; Kegan et al., 2001; Popp & Boes, 2001). Analysis tasks requiring abstract thinking capacities outstretch some learners’ meaning-making capacities. And while C-D theory can explain why some adult learners can’t or don’t learn certain things, fundamentally the theory is more about understanding what they can do and what their strengths are (Popp & Boes, 2001), so that we can start from there and support them toward achieving their goals. Creating an optimal holding environment for adult learners with an Instrumental mindset means supporting their points of view while at the same time encouraging them to think about what another person has said and to identify something that is useful about it; to begin to think about how another person’s point of view (that is different from their own) might be able to actually help them. The idea is to begin to link up meeting their own concrete goals with working together, so that a personal victory becomes a team victory. An optimal holding environment for adult learners who have a Socializing Mindset would include encouragement to come up with their own opinions and trust their own instincts; to begin to unpack ideas and values into aspects that they agree with and other aspects they don’t, to bring their focus internally to find their own preferences and passions. Adult learners with a Self-authoring Mindset tend to come into the classroom already self-motivated and clear about what they want to learn. The challenge for these students is to develop more patience for their classmates who haven’t yet developed that confidence and clarity. Encouraging your Self-authoring students to mentor others is a great way to support their confidence and their empathy and also help them challenge and clarify their own thinking and assumptions. We support our adult learners by meeting them where they are and starting with what they can do. And we challenge them by pushing on their thinking, giving them work that is just beyond what they can comfortably do—that is hard, but not too hard—so they can feel some success, but still have to reach. In the stretching and reaching, our adult learners can actually begin to feel their own growth and achievement. That is the reward for us as teachers, not to see our students reach our goals, but to celebrate with them when they reach their own hard-won goals. Baldwin, J. M. (1906). The Mental Development of the Child and the Race. New York: Macmillan & Company. Baldwin, J. M. (1975). Thoughts and things. New York: Arno Press. Baxter Magolda, M.B. (2009). Authoring your life: Developing an internal voice to navigate life’s challenges. Sterling, VA: Stylus. Baxter Magolda, M.B., Creamer, E.G. & Meszaros, P.S. (Eds.) (2010). Development and assessment of Self-authorship: Exploring the concept across cultures. Sterling, VA: Stylus. Belenkey, M. F., Clinchy, B.M., Goldberger, N.R. & Tarule, J.M. (1986). Women’s ways of knowing: The development of self, voice, and mind. New York: Basic Books. Darwin, C. (1968). The origin of the species. Harmondsworth, Middlesex, England: Penguin. Fosnot, C. (2015). Constructivism theory, perspectives, and practice (2nd ed.). New York, NY: Teachers College Press. Helsing, D., Broderick, M., & Hammerman, J. (2001). A developmental view of ESL students’ identity transitions in an urban community college. In R. Kegan, M. Broderick, E. Drago-Severson, D. Helsing, N. Popp, K. Portnow, & Associates (Eds. ), Toward a “new pluralism” in the ABE/ESL classroom: Teaching to multiple “cultures of mind” (pp. 77-228). Research Monograph, NCSALL reports #19. Boston, MA: World Education. Kegan, R. (1980). Making meaning: The constructive-developmental approach to persons and practice. Personnel and Guidance Journal, 58-5: 373–80. Lindsley, R. B. (2011). Constructive developmental theory and programming across cultures: An examination of the development and experiences of adult Burmese participants in a high quality adaptive capacity development program. (Doctoral dissertation). Retrieved from ProQuest Dissertations and Theses. (Order Number 3459743). McGuigan, R. & Popp, N. (2016). Integral conflict: The new science of conflict. Albany, NY: SUNY Press. McGuigan, R. & Popp, N. (2012). Consciousness and conflict (explained better?). Conflict Resolution Quarterly 29: 227–260. McGuigan, R. & Popp, N. (2007). The self in conflict: The evolution of mediation. Conflict Resolution Quarterly, 25(2), 221-238. Maturana, H. & Varela, F. (1972). Autopoiesis and cognition. Dordecht, The Netherlands: D. Reidel. Ouellette-Schramm, J.R. (2016). Developmental diversity in the academic language–learning experiences of adult English as a second or other language learners: A constructive-developmental study.” Adult Education Quarterly, 66(3) 219–236. Piaget, J. (1970). Structuralism. New York, NY: Basic Books. Piaget, J. (1954). The construction of reality in the child. New York, NY: Basic Books. Popp, N., & K. Portnow, K. (2001). Our developmental perspective on adulthood. Popp, N., & Bose, L. (2001). Competence as a developmental process. In R. Kegan, M.
Torbert, B. & Associates. (2004). Action inquiry: The secret of timely and transforming leadership. San Francisco, CA: Berrett-Koehler. Villegas-Reimers, E. (1996). Self-development of Venezuelan adolescents: A test of Kegan’s theory of subject-object interview in another culture. Journal of Cross-Cultural Psychology, 27(1), 25-36. Wade, J. (1996). Changes of mind: A holonomic theory of the evolution of consciousness. Albany, NY: SUNY Press. Winnicott, D.W. (1965). The maturational process and the facilitating environment. New York, NY: International Universities Press. In this article, King and Bigelow describe the development and implementation of innovative state legislation called the Learning English for Academic Proficiency and Success (LEAPS) Act. They highlight LEAPS’ potential to support language minority students in Minnesota’s public schools as well as how values of ‘Minnesota nice’ potentially impact its implementation. Minnesota has a decades-long history of welcoming and resettling refugees, and the state has long supported multilingualism through numerous immersion schools and K-12 world language programs for mainly English speakers. Concomitantly, there exists a longstanding gap in programming for minority language students, including inequitable statewide access to strong content-based English as a second language programs, an absence of policies and systematic instruction to develop and build upon students’ native languages These contextual facts have contributed to a significant academic achievement (or opportunity) gap between English learners, most of whom are students of color, and English-proficient students. 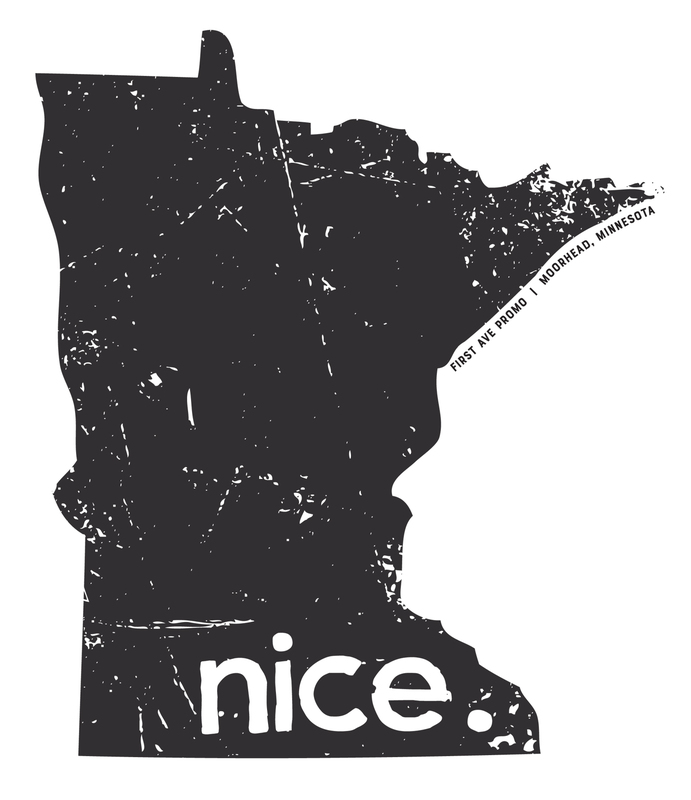 ‘Minnesota Nice’ is a term widely used in the region to refer to the stereotyped behavior of Minnesotans. To be ‘Minnesota Nice’ is to be polite, reserved, and well mannered, but also to prefer indirect communication, to minimize confrontation, to show emotional restraint, and to avoid calling attention to oneself (Veldof & Bonnema, 2014). Some have suggested that ‘Minnesota Nice’ can be traced back to the state’s historically significant Scandinavian population and attendant social and communicative norms, and further, that this so-called niceness is rooted in the values of upholding the social order, keeping people in their place, and maintaining appearances (Jones, 2009). The currency of “Minnesota nice” is strong in our state discourse (see Collins, 2017) and a frequent meme in local popular culture. Nevertheless, while the demography and norms of the state have shifted in recent decades, here we suggest that this long-standing component of Minnesota culture is useful in our examination of the development and implementation of the most recent state education policy: the 2014 LEAPS Act. The 2014 Learning English for Academic Proficiency and Success Act was written and passed by the state legislature (LEAPS hereafter). This far-reaching education law revises many state statutes to focus on English learners, including recommendations for greater support for students’ native languages. For instance, the legislation suggested new procedures for assessing English Learners (ELs) and teacher re-licensure requirements that focus on teaching ELs; it also specified features of programming and recommended teaching strategies that use community and cultural assets as a starting point. The law suggests that districts support literacy development in students’ native languages and develop assessments to that end. Furthermore, in light of the state’s significant refugee student population, the statute defined a specific EL student sub-category: Students with Limited or Interrupted Formal Education (SLIFE). Three years after its passage, LEAPS implementation work continues at the state and, more variably, at district levels. However, authorities and education officials across the state have simultaneously needed to meet deadlines to establish state policies and procedures as mandated by the reauthorized Elementary and Secondary Education Act (ESEA), called the Every Student Succeeds Act (ESSA). Besides competing pressures, additional challenges to implementation are found in the current unstable political climate wherein discourses of xenophobia and national isolationism are commonplace (e.g., Prather, 2015). Here we suggest that local culture, that is ‘Minnesota Nice,’ has shaped both the law’s development and implementation path. Data for this project come from interviews with key policy officials, including a state representative and Minnesota Department of Education (MDE) officials; close analysis of the text of law; and our long-standing professional involvement as advisors on multilingualism. At both the federal and state level, policy-makers increasingly have focused their attention on services and policies for K-12 ELs. Unfortunately, in Minnesota, this attention reflects the fact that the public K-12 education system is no longer recognized so much for its overall strengths, but for the marked disparities in educational achievement outcomes that it produces (Magan, 2015). In Minnesota, an important driver of this so-called ‘achievement gap’ is language – in particular the language opportunity gap, defined here as uneven access to multilingual educational programming and the benefits it provides (García & Otheguy, 2016). This ‘gap’ is most evident in comparing the additive vs. subtractive programming options for language minority and majority students in the state. Minnesota is a leader nation-wide in immersion programming in foreign languages serving monolingual English-speaking students (MAIN, 2017). While there are some two-way immersion programs that have large numbers of language minority learners, options for the state’s significant immigrant and refugee populations are largely limited to English-only services, the great majority of which provide no native language support. In this sense, the state’s ESL programs are largely linguistically subtractive as they are designed to promote cultural and linguistic shift to English with no opportunities to maintain the native language(s). Minnesota’s EL practices and policies for many years have not aligned with the wide and deep body of research indicating that students’ native languages can promote English language learning, the development of content knowledge and skills, and literacy acquisition as well as having social, emotional, and cognitive benefits in their own right (Baker & Wright, 2017). For instance, large-scale studies indicate that students who have the opportunity to develop and maintain their native languages outperform their peers in monolingual programs on measures of both English language literacy and content knowledge (e.g., Thomas & Collier, 2002). Among key legislators, growing awareness of the long-standing academic achievement gaps in the state and the lack of alignment with current research were important in the drafting and passage of the most recent state education policy. In 2014, the Minnesota legislature passed the Learning English for Academic Proficiency and Success Act (H.F. 2397), aka LEAPS. This law frames multilingualism as an asset for all Minnesota students and sets a high bar for native language support for ELs (Williams & Gross Ebinger, 2014). The legislation explicitly draws from a ‘language-as-a-resource’ perspective, which can be traced back to Richard Ruiz’s (1984) early discussion of language orientations. In his original formulation, in any given context, language might be viewed and treated by society as a problem to be solved, as a right to be respected, or as a resource to be positively valued and managed. In his early writings, Ruiz framed language as a potential economic, cultural, emotional, and social resource. However, in Minnesota (and elsewhere), this approach to language has been translated into policy (and popular discourse) rather narrowly as an economic resource only. Indeed, the language-as-an-economic-resource argument was a talking point frequently repeated by one of the bill’s authors, and also picked up in the media (Hawkins, 2014). This narrow, economic resource perspective has been critiqued in recent years as scholars have asked ‘whose resource’ and ‘for the benefit of whom?’ (e.g., Valdez, Delavan, & Freire, 2014). Here we consider three dimensions of LEAPS: its broad aims and how student native languages are framed; the high bars set by the legislation; and the opt outs provided. We draw from our analysis of interview and public discourse of one of the bill’s authors, State Representative Carlos Mariani; text of the law; and interview and public discourse of state officials tasked with implementation. Through close analysis of these texts, we demonstrate how local culture, in particular ‘Minnesota Niceness’ shaped the law’s development and implementation path. Students’ Native Languages: Right, Resource or Problem? LEAPS was described in the local press as “a revolutionary piece of legislation,” representing a “sea change in thinking about language skills and teaching” (Hawkins, 2014). Both government and press reports highlighted the ‘language as a resource’ orientation, for instance, noting that “right now, many perceive the fact that a student is acquiring English as a deficit that needs fixing. ELL advocates, by contrast, insist that Minnesota’s prosperity rests on seeing multilingualism as a tremendous asset” (Hawkins, 2014). One of the law’s two authors, Representative Carlos Mariani, commented that the legislation “sets the expectation in state law that ELL services be delivered in a way that looks like the home language of the learner.” This, according to the same press report, means that the law mandates that districts must “ensure students are literate in at least their home language by third grade” (Hawkins, 2014). It is not unusual for more than one ‘resource’ or ideology to surround a particular language policy. Indeed, in the text to the right, we see that Representative Mariani takes up multiple orientations. First he suggests that affirming students’ first language and identity is both an individual right and a means to address a problem (that is, EL students’ overall academic performance). Although with some (‘Minnesota Nice’) mitigation (e.g., noting with a laugh that this might be his particular ‘thing’ and not true for everyone), he argues that multilingualism is an asset that should be supported and valued for all across the school system. The description of the law authored by its co-authors strongly takes up a similar ‘language as a resource’ framing; this overview document describing the legislation states, “we must act now” because “English language learners are an untapped economic asset. In our increasingly global economy, Minnesota stands to benefit from growing our pool of multilingual workers” (Mariani & Torres Ray, 2014). Despite this overt ‘language as a resource’ orientation, the legislation contains multiple points of ambiguity in how students’ native languages are framed. For instance, the title of the law highlights learning English and academic success, rather than, say, multilingualism for all. And in text of the law, there is no clear direction on whether native language development is a goal or a means to an end (English). Both positions are evident throughout. As an example, in the section on staff development (Sec. 6, Subd 44), the law states that licensed teachers must be able to serve “the oral language and linguistic needs of students who are English learners by maximizing strengths in their native languages in order to cultivate students’ English language development.” The law suggests that teachers, and teacher preparation programs are required to use the native language only to the extent that it supports EL development. In contrast, the commissioner is required to report on the progress of eligible districts, specifically on “native language academic literacy,” (Sec. 120B.36, subd 1) suggesting that this is a goal in and of itself for all students. At the same time, early childhood family education programs ( “are encouraged to provide parents of English learners with translated oral and written information to monitor the program’s impact on their children’s English language development, to know whether their children are progressing in developing their English and native language proficiency, and to actively engage with and support their children in developing their English and native language proficiency” Sec 124D.13, subd 2). Here, early childhood family education programs are tasked with promoting English and native language proficiency as distinct and independent goals. This ambiguity presents challenges to those tasked with implementation, most notably to policy officials at the Minnesota Department of Education (MDE) who must interpret the legislation, prioritize goals and objectives, and provide technical support to those ends. Many meetings and considerable effort has been put into unpacking what the legislation means. As a state key official noted to us in an interview (May, 2017), this is multi-layered work as there are multiple points of disconnection across: what the text of the law mandates; what was reportedly intended by the law; and what is widely believed and claimed to be in the law. As detailed below, these processes are further complicated by the high bars set by the legislation and by the local, Minnesota-Nice culture. LEAPS Objectives and Unrealistically High Bars? Among those who are familiar with the law, there is agreement on one point: LEAPS sets a high bar across multiple areas of practice given the linguistic diversity of the state, the broad geographic dispersal of the state’s EL population, the lack of training of educators in ways to use languages other than English for instruction, and the challenge of assessing native language academic literacy (Williams, 2014). For instance, LEAPS encourages school districts to survey parents’ in their native languages about their school satisfaction. Another example: early childhood family education programs are to provide parents with oral and written information about student progress in their developing skills in both English and native language(s). Developing these assessments, administering these tests, and communicating these results in multiple languages is a significant challenge for many districts. About 8.3% of Minnesota’s public school students were identified as ELs during the 2015-2016 academic year (Johnson, 2017). While enrollment has typically been greater in urban Twin Cities (Minneapolis-St. Paul) districts, EL enrollment has increased in recent years across state, with significant numbers of students now in many rural and suburban districts. The state is also defined by large numbers of typologically distinct languages, with significant numbers of student speakers of Spanish, Somali, Hmong, Vietnamese, Karen, Arabic, Chinese, Russian, Oromo, Lao, Amharic and Khmer (the top 12 non-English languages spoken by MN students). More than 100 languages are spoken in homes and communities around the state (Hirsi, 2015). Depending on how one interprets the law, to fully enact LEAPS, Minnesota would need valid and reliable assessments in all of the native languages (and dialects) spoken by students. LEAPS sets high targets not just across a wide range of institutional contexts (e.g., from early childhood programs to teacher training institutes) but for different types of students, that is both ELs and native English speakers. For instance, under LEAPS, any student who can demonstrate proficiency in a non-English language is eligible for one of three types of seals of bilingual or multilingual proficiency from the state (and if requested, college credit). While MDE has provided technical, testing and administrative support in Seals implementation, the awarding of, and support for seals varies widely by district and by language. Of course, the text of the law addresses not just the multilingual seal, but a vast range of areas, including requirements for educators, including teacher and administrative licensure candidates; rules for districts concerning staff development plans to better support ELs; guidelines for early childhood education programs, for instance, to use culturally responsive pedagogy; and mandates that Adult Basic Education (ABE) programs offer English language instruction. Other sections of the law establish mandates for colleges and teacher training institutes, and for statewide systems of education in terms of both accountability and reporting as well as technical assistance. Given the extensive number of areas that LEAPS addresses, and the high bars set throughout the legislation, state officials needed to engage in extensive work to interpret the law and develop an implementation plan. MDE staff conceptualized their tasks with respect to LEAPS in terms of three ‘buckets’ of work. In our meetings with them (April 2017), these informally were conceptualized as: (1) supporting multilingualism as asset, (2) establishing appropriate programs and develop for staff, and (3) developing cultural competence among teachers. These areas of work were viewed by staff as three ‘levers’ that drive implementation, and to some extent, are compatible with on-going work in the MDE and in other parts of the state. MDE leaders are limited in terms of two factors: fiscal support for this work and an expressed (Minnesota Nice) preference to avoid mandating down to districts and to avoid confrontation. Perhaps in part as a result of these two factors, an early project in implementation work around cultural competence was to begin with a self-study of MDE administrative and technical support staff. And furthermore, as discussed below, staff tended to interpret the legislation rather closely to the text (rather than the possible intent of text) and to prioritize and emphasize those aspects with the clearest mandates. While high bars are set by the law, numerous opt-outs are built into the legislation. For instance, “districts are encouraged to use strategies that teach reading and writing in the students’ native language and English at the same time” (122A.06, subdivision 4, italics added). Another example: teacher “preparation programs must include instruction on meeting the varied needs of English learners, from young children to adults, in English and, where practicable, in students’ native language” (122A.14, subdivision 2, italics added). In both cases use of students’ native language is not binding but rather “encouraged” through the phrase “where practicable”. As Representative Mariani suggested to us, the opt-outs were the result of consensus seeking and conflict avoidance. For educational leaders in the state, these opt-outs end up being critical in making implementation decisions; the particular choice of modals in the law plays an important role in setting priorities. As one state official told us, “We focus on the musts, wills, and shalls in the law.” For instance, the law mandates that “eligible Head Start organizations must submit a plan to the department for approval on a form and in the manner prescribed by the commissioner” (119A.535) (emphasis added). This requires state staff to work with all Head Start organizations on a revised application process. Similarly, the legislation “establishes” voluntary state bilingual and multilingual seals and mandates that the state “must develop a Web page for the electronic delivery of these seals.” (120B.022) (emphasis added). Lastly, a definition for students with limited or interrupted formal education (SLIFE) was provided (Sec. 37.124D.59), and regional Centers of Excellence “must work with school site leadership teams” to better support these students. (120B.115) (emphasis added). Use of the modal must and the absence of opt-outs here has meant that each of these topics have received significant and early attention from MDE staff (e.g., 10/6/14). While there are abundant opt-outs throughout the legislation, there are other areas with clearer mandates and less flexibility. For instance, the law states that all “teacher candidates must be instructed in using students’ native languages as a resource,” a mandate that places instructional innovation on the shoulders of institutes of higher education and on the most novice educators in the state (122A.18, subd 2a) (emphasis added). Furthermore, LEAPS states that “a school readiness program provider must assess each child’s cognitive and language skills with a comprehensive child assessment instrument when the child enters and again before the child leaves the program (124D.15, subd 3) (emphasis added). Items such as these seem to have received less attention from policies makers; for instance, they were not mentioned in our interviews with staff and do not seem to be getting immediate attention from MDE. In sum, state officials have prioritized what they are required to do by law. Their priorities are to a large extent determined by where ‘opt-outs’ are provided (lower priority) and where mandates are clearly stated (higher priority). Furthermore, as evident with the cultural competence example above, state officials position themselves as reluctant to prescribe activities or policies to local districts, and willing to seek direction from local districts and stakeholders rather than leading with their interpretation. This is politically astute, but also fits with local preferences for indirectness, minimization of conflict, and maintenance of social order. Discussion: ESSA and Local Action to Come? LEAPS legislation is broad, asset-based, and informed by current research in applied linguistics. It is also, in some respects, best understood as an aspirational text. To some, the law is already succeeding and has fulfilled part of its intention by drawing attention to the needs of ELs. As Rep. Mariani noted in his interview with us, “There’s an energy there, and an excitement there.…It’s created kind of a newness that allows them to talk about what they’ve always been doing, those who are really effective” (April 2017). Yet the path forward towards full implementation is unclear for several reasons. First, the authors who championed the bill are largely uninvolved with implementation. As Rep. Mariani noted, “Honestly, you know, once a bill goes through, you know, it’s like, it’s out of my hands, you know.” Furthermore, since the 2016 elections, both Rep. Mariani and Sen. Torres Ray are now in the minority in the House and Senate, respectively. Among other challenges, this means the continuing appropriations to support LEAPS are not guaranteed. The second complication is that it is not clear what full implementation entails. On the one hand, many of the practices described in the law were already underway or in practice. For instance, many districts already employed family communication specialists and translators. On the other hand, much of the work that is directly related to LEAPS may not be viewed as implementation. For example, as noted above, state officials engaged in a self study of cultural competencies across their agency. Furthermore, as noted above, there are many aspects of the law that are subject to interpretation. For example, it is possible to interpret the requirements around native language literacy assessments to be applicable only to the small number of students enrolled in bilingual programs, not to all English learners. Lastly, how LEAPS will intersect with the new ESSA requirement remains to be seen. Passed in December of 2015, ESSA eliminates ‘adequate yearly progress’ mandates and NCLB’s 100 percent proficiency goals, but requires statewide, standards-based goals and measures for students, and continues to require disaggregation of groups for reporting. ESSA requires states to devise an accountability plan, and in Minnesota this has been an 18-month-long process involving significant stakeholder engagement and new policy creation. ESSA is potentially a two-edge sword. On one side, state ESSA work has overshadowed and taken staff time away from LEAPS implementation. On the other, EL students’ academic performance will be more salient under ESSA than NCLB. Under ESSA, EL’s English proficiency is a criteria that must be used by states to identify schools in need of improvement. Some state officials believe that this intensified spotlight on EL performance will mean local administrators and school principals increasingly will be need to seek state-level support for meeting the needs of ELs. However, with both houses under the control of Republicans (who are historically less likely to support multilingual policies) , this work will need to take place at the ground level through innovation and initiative taken by individual districts. Furthermore, ESSA requires states to recognize native languages. For example, native language assessments must be made available for all languages present “to a significant extent” in a state, and the regulations require that states define what it means for a language to be present “to a significant extent,” including that the most common language (besides English) be included in that definition (Section 1111(b)(2)(B)(vii)(III)). Overlaps between LEAPS and ESSA are fortuitous and suggest one path to maintain and further LEAPS implementation. By looking closely at the text of the law, through interviews with key state officials, and ongoing consultation work with key stateholders, this article has analyzed how one recent state-wide piece of legislation, LEAPS, was developed and is currently being implemented. Our analysis revealed some of the negotiations that shaped the text of the law, for instance, highlighting how political expediency and conflict avoidance resulted in many opt outs. These, in turn, rendered the legislation less explicit, more open to interpretation, and less prescriptive. Second, this analysis suggests how language policy development and implementation are deeply intertwined with local culture, in this case, local norms of Minnesota Nice. These norms of indirectness, conflict-avoidance, and politeness shape how the law was negotiated and implemented. This is evident both is the features of the text of the law, but also in how its development was narrated. Third and finally, this chapter points to the ways that mid-level policy makers, in this case, state education officials, are central, but often overlooked in policy implementation and prioritization (Johnson, 2010). In his research in Philadelphia, Johnson (2010) found that at the mid and local level, policy interpretation and construction ‘pried open’ ideological spaces, which in turn allowed bilingual teachers to adopt language policy in ways that benefited bilingual learners. Our analysis, in turn, suggests that our state has narrowly interpreted the law in ways that emphasize technical compliance, partly in keeping with local cultural norms. We hope that through ongoing collaboration and synergistic alignment with efforts such as ESSA, LEAPS implementation will reach more students, in more districts, and prioritize students’ native language development and multilingualism. Baker, C. & Wright, W. (2017). Foundations of bilingual education and bilingualism. Clevedon, UK: Multilingual Matters Press. García, O. & Otheguy, R. (2017). Interrogating the language gap of young bilingual and bidialectal students. International Multilingual Research Journal, 11(1), 52-65. Johnson, A. (2017). Minnesota Multilingual Equity Network: English learner-Every Student Succeeds Act Initiative. St. Paul, MN: Coalition of Asian American Leaders & Minnesota Education Equity Partnership. Johnson, D. C. (2010). Implementational and ideological spaces in bilingual education language policy. International Journal of Bilingual Education and Bilingualism, 13(1), 61-79. Riessman, C. K. (1993). Narrative analysis (Vol. 30). Thousand Oaks, CA: Sage. Thomas, W. P., & Collier, V. P. (2002). A national study of school effectiveness for language minority students’ long-term academic achievement. Washington, DC: National Clearinghouse for Bilingual Education. Valdez, V. E., Delavan, G., & Freire, J. A. (2014). The marketing of dual language education policy in Utah print media. Educational Policy, 30(6), 849-883. 1A fuller version of this argument and analysis can be found in King, K.A. & Bigelow, M. (in press). The politics of language education policy implementation: Minnesota (not so) nice? In T. Ricento (Ed.) Language and Politics in the U.S. and Canada. Cambridge: Cambridge University Press. Featured image was provided courtesy of First Ave Promo-Moorhead, MN.